Recently I’ve observed some interesting deer behavior and learned a couple new words/terms in my readings about white-tailed deer. 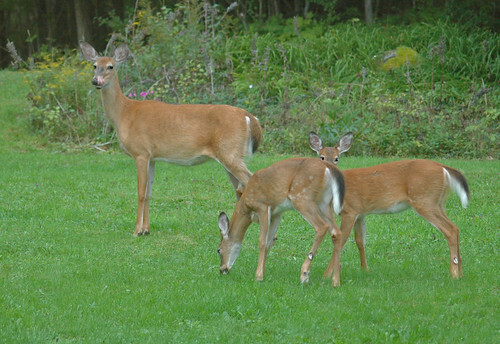 Male deer tend to live in groups of three or four except in the mating, or rutting, season. We have often watched a group of males over the summer and early fall as they have fed in a nearby field. Recently this group has been seen (seemingly) playfully sparring, or perhaps testing the waters, while grazing together. Perhaps it will become more serious in the upcoming weeks as the mating season heats up, so to speak, and the group breaks up. I guess it is not too unlike a group of human male friends who become interested in the same girl and the strife this can cause. 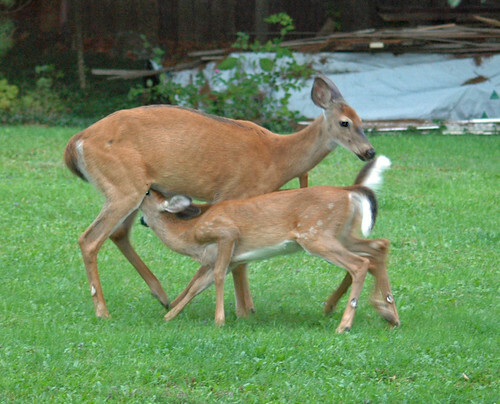 The mating season occurs in October-November and the fawns tend to be born in May-June. These fawns were born this past spring and have also been regulars in the area. Most sources state that the fawns are weaned at about six weeks. But, while these fawns also fed on grasses and apples, they were quite vigorously nursing from mom at an estimated age range of 12-16 weeks. A much quieter and, perhaps, pleasant moment for mom. 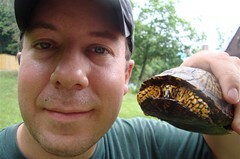 Bergmann’s Rule: size within a species tends to increase as distance from the equator increases. I have noted a big difference in the sizes of white-tailed deer that I have seen from Florida to Canada. Bergmann’s hypothesis about surface area-to-volume and heat loss is one possible explanation for this. 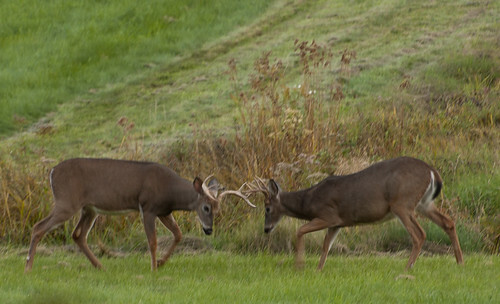 The deer shown here were photographed in Ontario. Crepuscular: active at dusk and dawn. 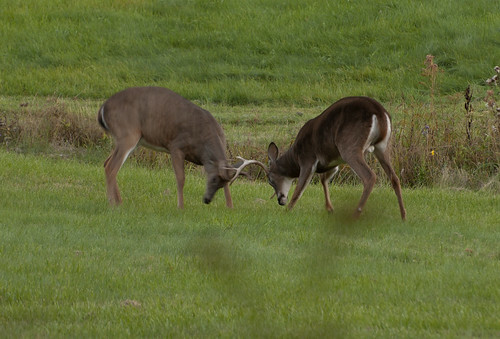 This is the time when deer most actively feed. This entry was posted on 26 September 2013 by patacoate. It was filed under iPhone .